Over the last couple of years I was invited to many weddings. Some were religious ceremonies, some were spectacular celebrations, and some were humble intimate events were the couple simply exchanged their vows. However, over the years I've noticed an interesting repetitive pattern - when the wedding was an "over the top" show off event, the couple's relationship didn't last more than a year or two. 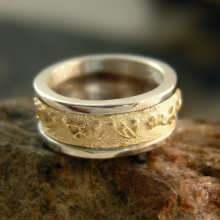 On the other hand couples that chose a humble, unpretentious ceremony or even never got married are still together. The reason for that in my opinion is that people tend to focus on the outside, on the visible materialistic side, without taking into consideration that any relationship is a lifelong journey of commitment, the ability to face changes and to be there for each other. 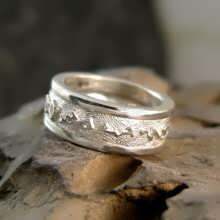 Over the years I received many requests to make Talismanic wedding and relationship rings, I've finally came up with a unique concept for such rings. 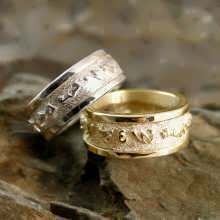 These rings are intended to strengthen the bond of love and compassion, helping couples unite and act together in harmonious partnership, while maintaining each person's uniqueness and individuality and focus on the things that really matter. 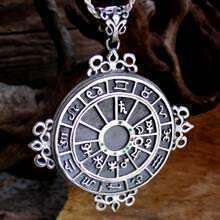 When ordering these Talismans, you need to send us both of your birth dates, time and place of birth as accurate as possible. Our in-house astrologer - Michael Ofek prepares your birth charts and your composite chart (a chart derived from both charts, signifying the unique combinations of energies that makeup the relationship). 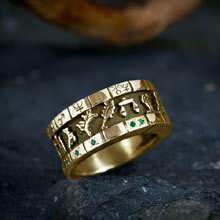 He will then determine the right time for the Talisman rings to be “born”. 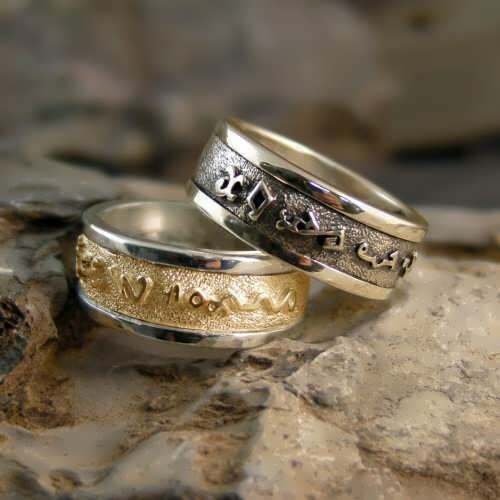 These Magical wedding Rings invoke the energy of the Sun and Moon, as the basic male female archetypes. 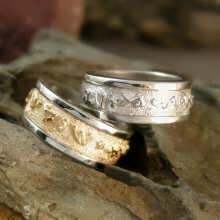 Intertwined in their courses and complementing effects, they symbolize the “alchemical wedding” of man and women. The alphabet, or planetary characters are taken from the "Picatrix" (a very important magical text that compiles many ancient magical text) and from “Three books of occult philosophy” by the renaissance mage Heinrich Cornelius Agrippa. 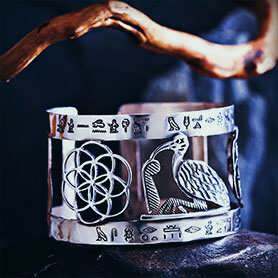 Like other magical planetary symbols, the alphabet intention is to communicate with the planetary spirit and drew its energy. 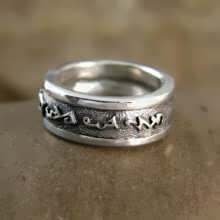 We also offer these rings as Personalized Solar and Lunar talisman rings are made according to your birth chart. 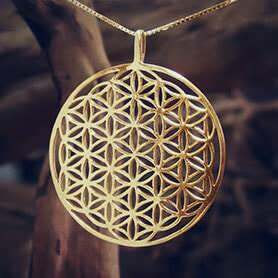 Symbol of optimism, creativity and success. 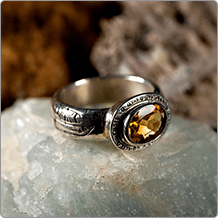 Solar Talisman Ring is made to sharpen the mind and strengthen your life force. 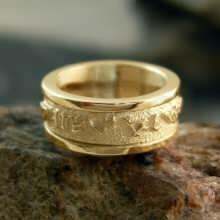 This ring focuses on leadership, wilpower, strength, durability and your own focus and commitment to your path. 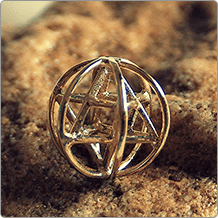 A talisman forIncreasing wealth and success. 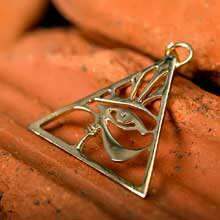 Also said to induce empathic communication and calming the mind. 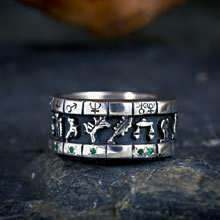 This ring focuses on connecting to the realms of creativity, imagination, mysticism and the hidden unseen dimensions. 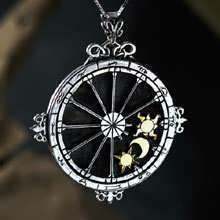 At the time of ordering these Talismans, you send us your date, time and place of birth as accurate as possible. 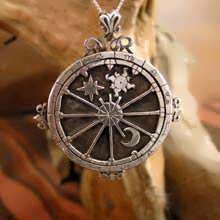 Our in-house astrologer - Michael Ofek prepares your birth chart for the talisman and analyzes the chart to find the exact time that the configuration of the planets is in it's most balancing, empowering and strengthening state in correlation with your birth chart. 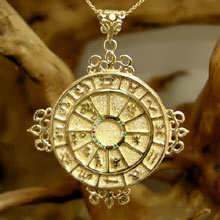 David will assemble the Talisman (and magically consecrate it) at that exact point in time, In this celestial window of opportunities that stress your full potential and help resolve difficult combinations. 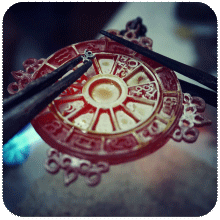 This Talismans, is our way to recreate this almost lost art of individualized Talismans. 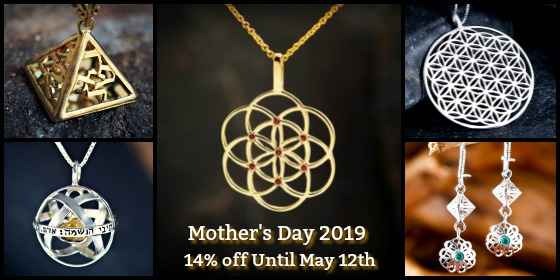 The result is a unique one of a kind jewel that you won't find anywhere else!!! 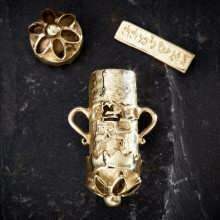 Over Soul pendant contains a small plate engraved with the bearer's name in Hebrew. 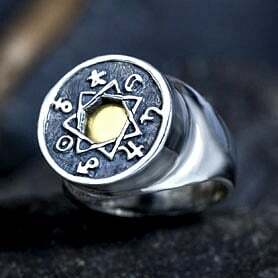 In between the letters of the name, the letters of the Hebrew word for soul – “Neshama” - are engraved in unique Kabbalistic font. 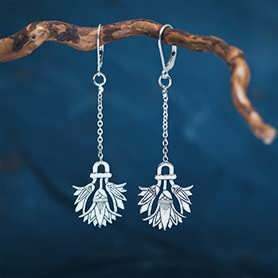 This pendant is a personal and unique charm. 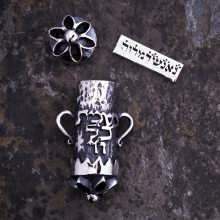 The small canister is inscribed with the word "NISHMAT KOL HAI" - meaning "The soul of all beings".